Color City has launched a new township project Color Homes located at NH-24, Ghaziabad. The project is 7.5 acres integrated township comprising of residential, commercial and institutional space, located in the heart of Ghaziabad, GH-3/4, Aditya World City, Park Town, Wave City NH-24. This world-class living habitat promises an eco- friendly environment and will offer the other activities and modern day living amenities. Color Homes offers 2 BHK, 3 BHK and 4 BHK luxurious apartments surrounded in a pollution free green environment. Color Homes?where mystical colors of life unfold! NH-24 is a long stretch highway that spreads via Ghaziabad. Apart from this, there are multiple numbers of major corporate offices, a famous state of the art educational institutions, lifesaving hospitals are also there in a close vicinity. With innovative developments and infrastructure, laced by premium residential, commercial, industrial and retail projects, this locale is the place where the investors and buyers have an eye on. What is the project location?The project is located at NH-24 Highway, Ghaziabad. What is the area of apartments in Color Homes? The area of apartments offered in the project ranges from 795.0 sqft to 2745.0 sqft. How much is area of 2bhk in Color Homes? 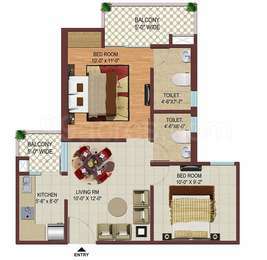 Two-room units (2BHK) in the project are available in an area of 795.0 sqft to 1075.0 sqft. 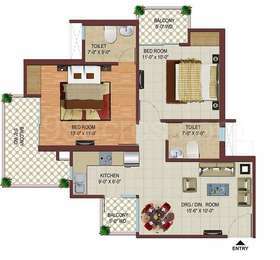 What is total area of 3 bhk in Color Homes? 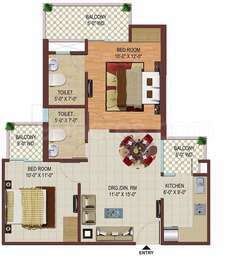 3 BHK units in the project are available in a size of 1330.0 sqft to 1680.0 sqft. What is the area of 4 bhk in Color Homes? The size of 4BHK units in the project ranges from 1940.0 sqft to 2745.0 sqft. How much is the actual area of Color Homes?The area of the project is 7.5 Acres. All copper wiring in PVC concealed conduit. Hi Sadam, I have booked a villa here. if nationalized banks are funding loan on the same project that means this project is approved .